After postponing it for health complications, on Wednesday, April 17 at 1:00 in Hinkson Hall, the Henry Center and Jonathan Edwards Center will host Oliver Crisp (Fuller Theological Seminary) for our co-sponsored Edwards and the Church series. In his lecture, “Jonathan Edwards on Preaching,” Crisp will present Edwards’ understanding of the nature and task of preaching. Pastor Josh Mood of College Church (Wheaton) will respond. 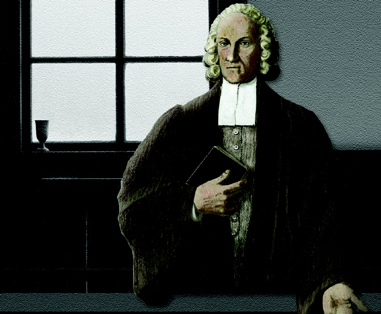 Jonathan Edwards, in the popular imagination, is synonymous with the hellfire preaching of the puritans. In this lecture, Oliver Crisp will present a fuller portrait of Edwards the homiletician, articulating Edwards’ understanding of the nature and task of preaching. While dissimilarities between Edwards’ social context and our own makes any univocal appropriation impossible, Crisp argues that Edwards’ understanding of preaching as an exercise in rhetorical power, whereby words are believed to change hearers (heart and mind) via the attending work of the Holy Spirit, remains commendable. Report on Witchcraft Colloquium, AIU, March 2013Trinity Debate, Whose Commons? Which Good?